“Don’t fix it, if it’s not broken!” This is a quote I’ve heard my dad say a million times over throughout my lifetime. I remember when the Blackberry first came out and I wanted to trade in my hot pink Motorola flip phone so that I could get a pin and enter the world of bbm-ing (this dates me a little since kids these days know their Blackberry pins before their social security number!). But, my dad wouldn’t have it. He refused to upgrade me because my Motorola worked just fine. I then made it my mission to break that little phone and quickly learned that Motorola phones are nearly indestructible—much unlike Blackberrys! That pink phone had loose wires coming out of one end, had duck-tape keeping the battery in, and had a simultaneously cracked and water damaged screen, but wouldn’t you believe it still made phone calls! Now the biggest annoyance in my day is when my trackball gets stuck and my bbm is slow (and to this my dad would say, “be careful what you wish for!”) But, back to point…don’t fix something if it’s not broken! Likewise, don’t feel pressured to always try a new menu item when you have already found a dish that you love at a restaurant! When I find something that I really like at a restaurant, I stick to ordering it because I then I am never disappointed! One place that I go for the same dish every time, is Georges in the Grove (they also have opened a place in Sunset, but I was there the other night and very disappointed by the unfriendly service, which never happens at the one in the Grove!). Anyways, the dish to order is without doubt is the Steamed Fresh Mussels with garlic, shallots, and parsley in a white wine butter sauce served with french fries. I really don’t even think that there are adjectives in the English language to describe how incredible these mussels are. Just…wow! 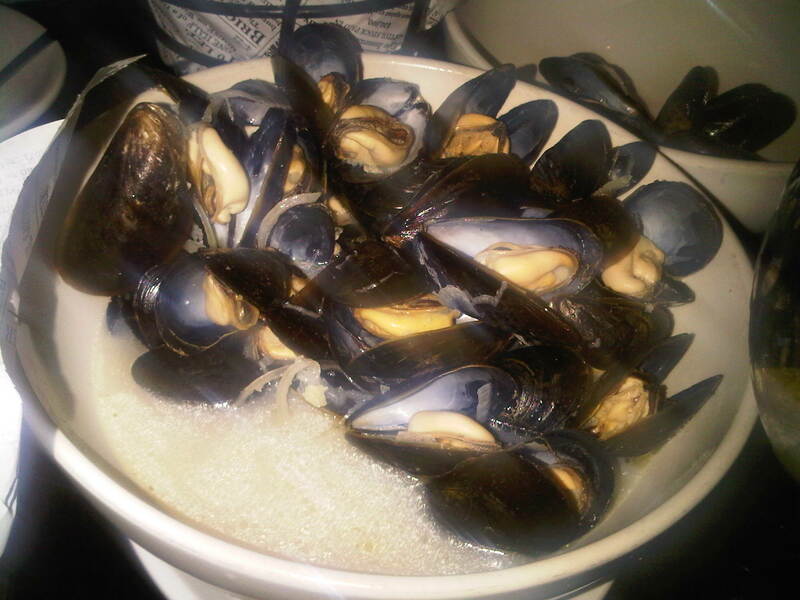 The mussels are enormous and succulent and the sauce is outrageously good. As soon as I get the bowl, I drop a few slices of french bread into the sauce to let it soak…yummm. And best of all, they are served piping hot and do not cool off before you are finished, so you can take your time. Also, if you are into truffle flavor, ask the waiter to bring you truffle fries instead of plain fries (the Georges in the Grove will do this at no charge…but the same cannot be said for the one in Sunset—I’m really hating on them). 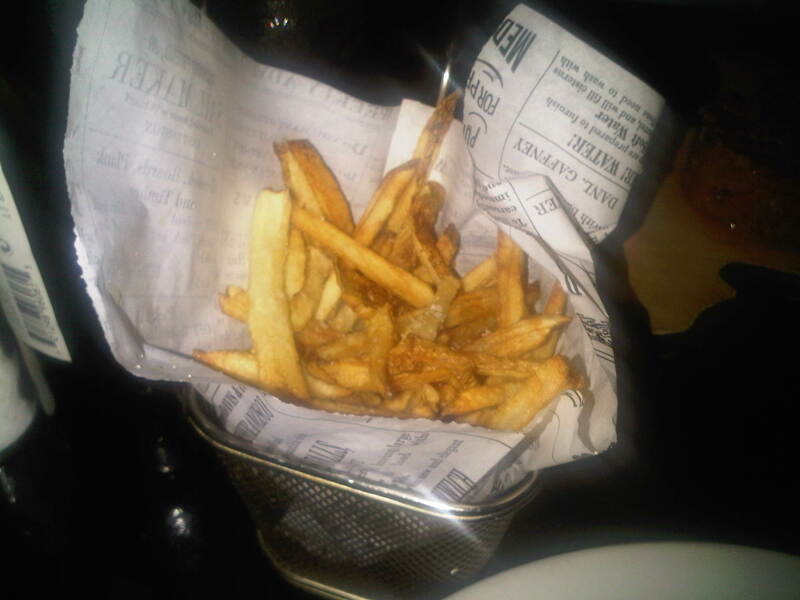 The fries are delicious and taste fresh cut, and also go well with the white wine sauce. Steamed Fresh Mussels with garlic, shallots, and parsley in a white wine butter sauce served with french fries. Of course, I have also tried other menu items (all very good), but if someone won’t split the mussels with me for an appetizer, then I have to get them for my entrée. On the occasion that someone will split them with me for a starter, I like to order the Steak Tartar, served with Truffle Fries and Mesclun Salad. 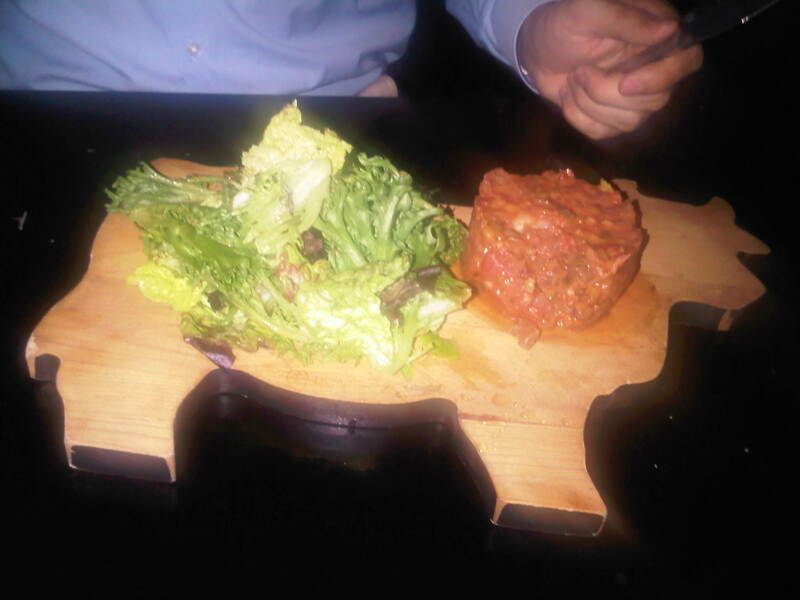 Not too many places do steak tartar and so I take advantage of this menu item when I go. It sounds gross, but it is delicious. 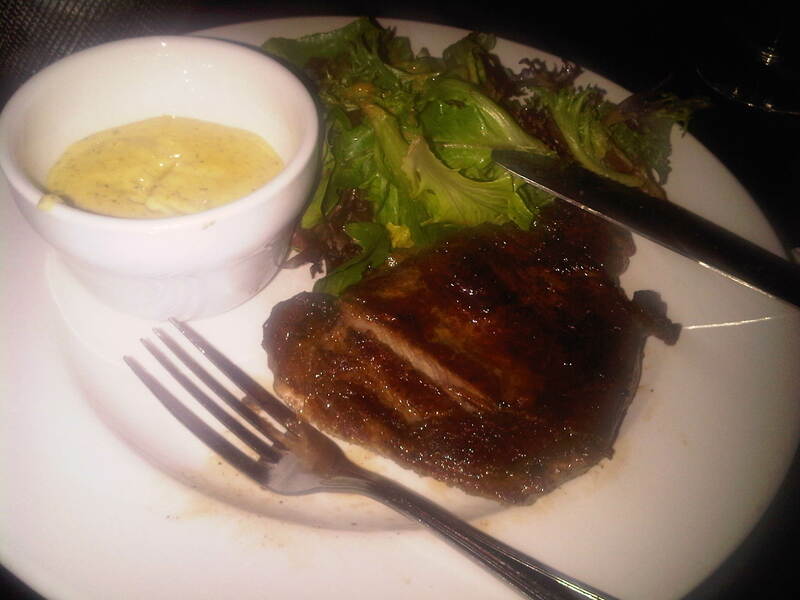 And for those of you who like your meat cooked, the Steak Frites with Bearnaise Sauce is also amazing!! 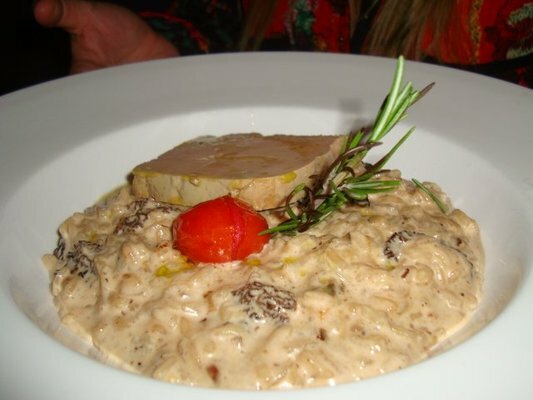 If you’re looking for a carb, then I highly recommend the Morels Mushroom Risotto with Shaved Foie Gras (pictured at top). It is straight up high-class comfort food! The only thing I am not crazy about is the pizza at Georges. The crust doesn’t ever get crunchy on the bottom and so the dough is very chewy, which isn’t my thing. I ordered the Proscuitto and Arugala Pizza for lunch today and was pretty disappointed. But other than that, everything else on the menu is a go! The atmosphere (at the one in the Grove) is very hip and chic with a lounge feel. And don’t be alarmed when the disco balls light up and the club music comes on for someone’s birthday, because it seems that everyone goes to Georges for their birthday! Ohhh and they give you a free mimosa with breakfast and lunch, or a glass of champagne with your dinner (again, at the one in the Grove…the one in Sunset didn’t)!